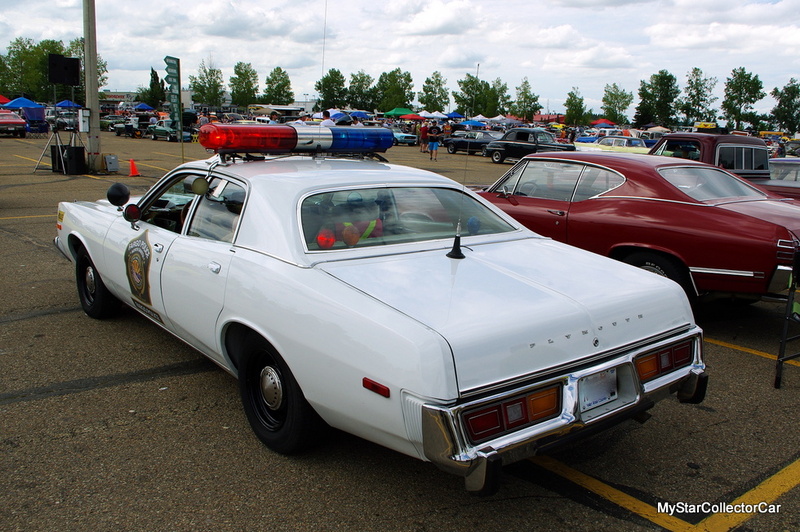 There are many trends in the old car hobby and one of the hottest is the vintage police car. 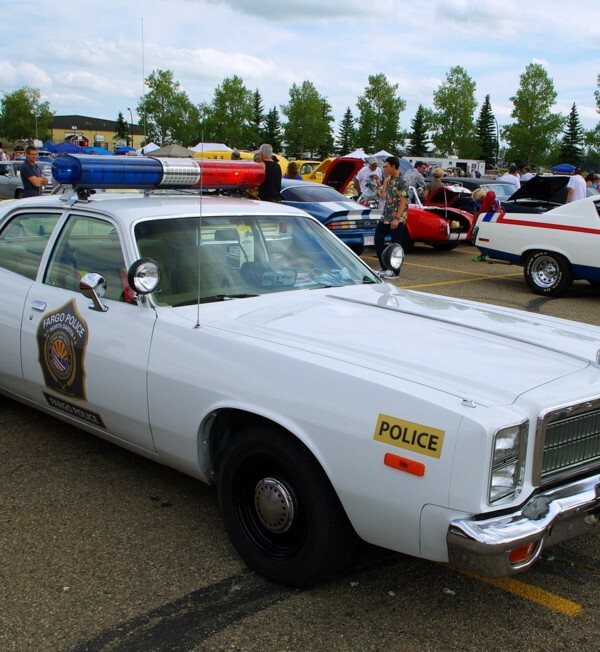 The shortage of real ex-police cars has started a mini industry of cloned police cars built from older 4-door sedans. 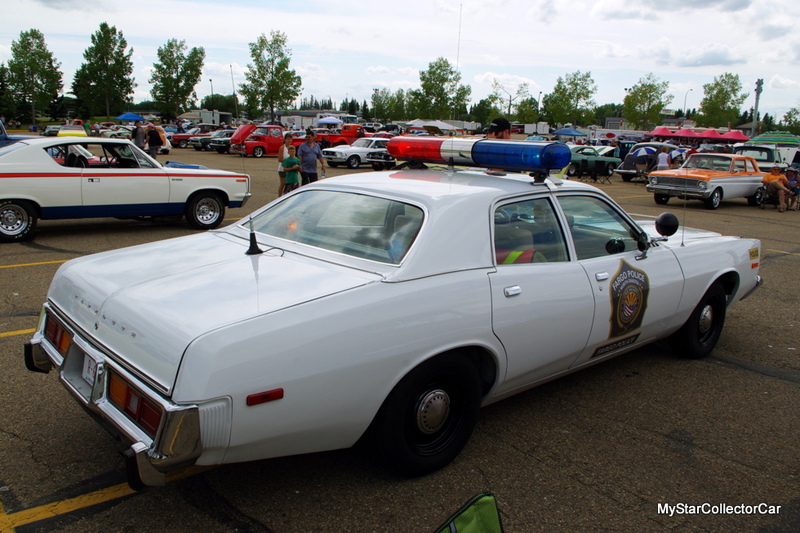 James Young is a big fan of vintage police cars so he knew the odds were against finding a mint ex-patrol car so he started a search for a solid old sedan—an ex-civilian car, as he called it. He found the definitive “little old lady’s car” in the form of a mint ’78 Plymouth Fury 4-door sedan. These cars are not at the high end of most car guy’s wish list so they end up as demolition derby cars in a gruesome conclusion to a life well-lived. James said the “B-body sedans are getting really hard to find” and demo guys don’t help the cause. James pounced on this survivor because–obviously, “a bunch of people wanted it for a demo derby car” so in a sense of real justice, he saved this classic from the clutches of evil. 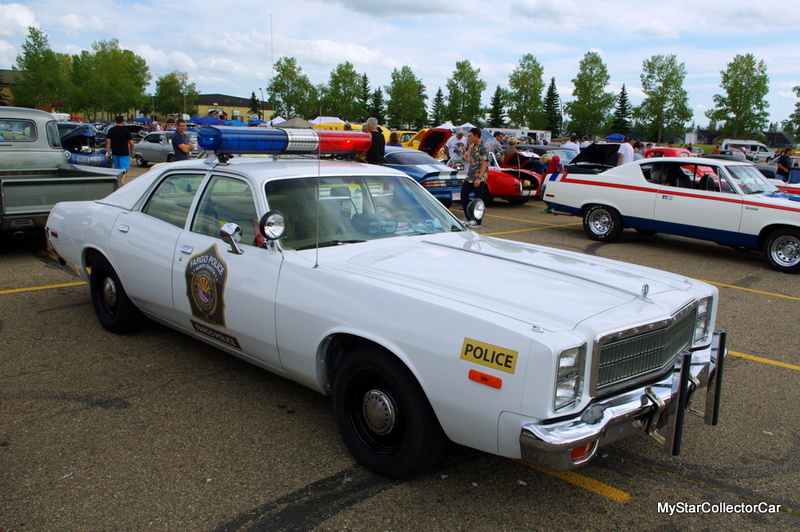 He started by stripping the ’78 Fury down to a more bare-bones police car look, “It’s a cop car-so shouldn’t have all the options” and added a period correct light bar, spotlights (ex-CHP) and Mopar cop wheels. He kept the stock 360 because it’s still a strong engine. 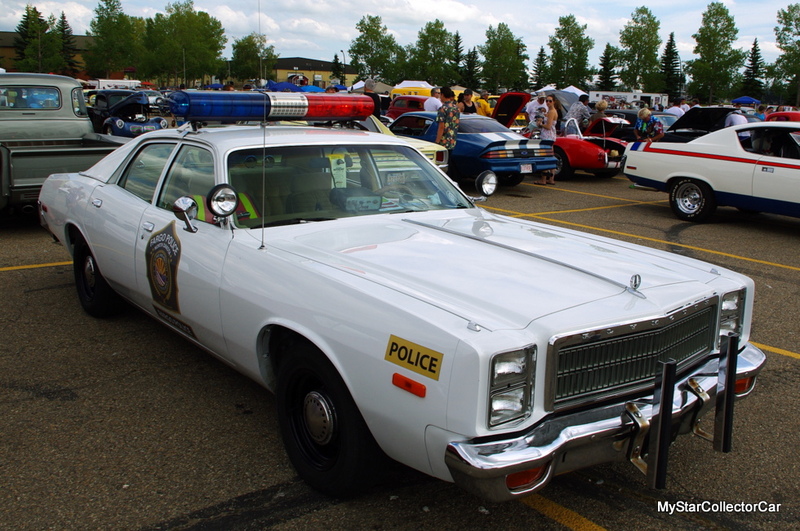 This Fury was originally a brown car so James had it decked out as a Texas Highway Patrol car. He took it to a General Lee Charger gathering and one of the owners came up and told him, “it was his wife’s grandmother’s car”. The Charger owner said he was “glad somebody did something good for the car” because he was worried what would happen to this mint 4-door sedan. 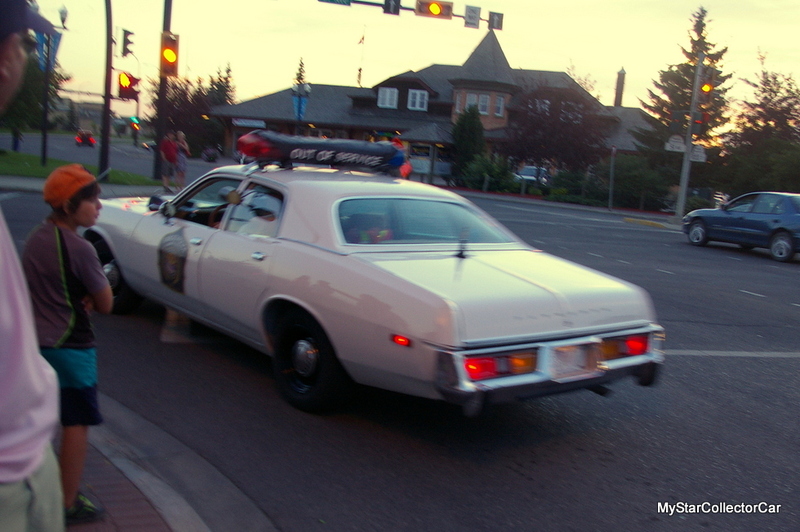 The ‘78 Fury became a TV star last winter when the series ‘Fargo’ came to shoot and they needed 70s era cars. 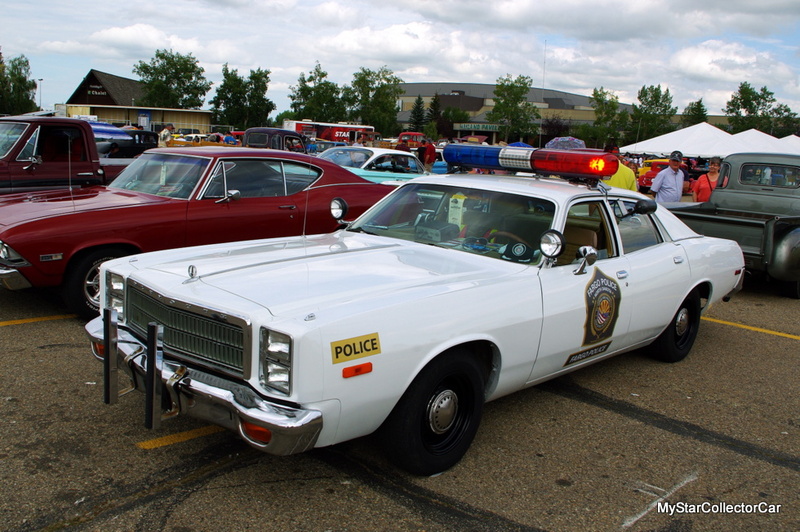 His wife told them about his police look Mopar and they wanted it in a big way so they painted it white and added it to the show. 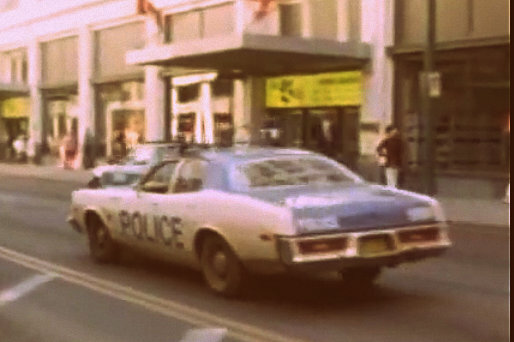 James has a lot of fun with this vintage look police car because it’s a natural curiosity piece in the public’s eye. He was on a vintage car downtown cruise and “some guy in a Chevelle did a brake stand” so he hit the lights and really got his attention. He added: “There’s a constant stream of cell phones out taking pictures when I drive it on the highway” and if he stands around there’s always someone taking pictures. He gets a lot of “Look, it’s Roscoe’s car” or “it’s a Smokey and the Bandit police car” when he’s at a show. He has to run with an “out of service” sign over the light bar because of laws but he finds most police officers—especially city police really like his old police car. 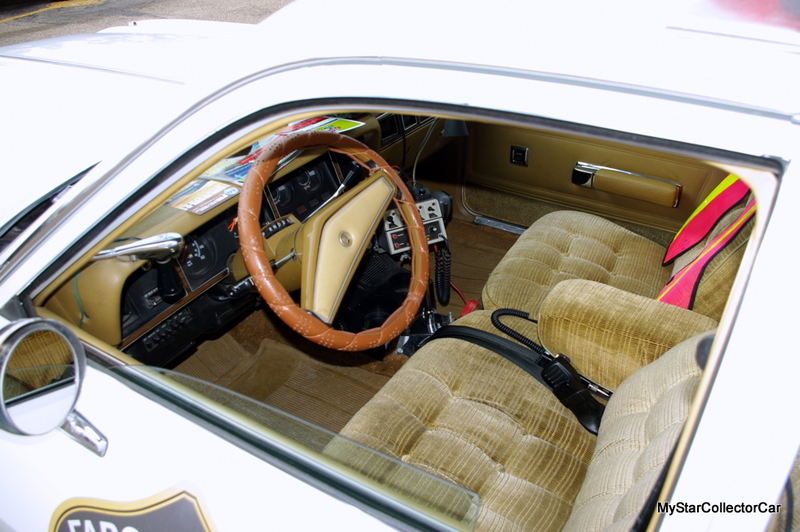 They’re naturally curious and quite a few have had their pictures taken in the ’78 Fury. James has his Fury at the point where it’s pure fun now after a fair amount of work so he’s going to leave it in the ‘Fargo’ police colors for now and just enjoy the ride. That’s what you do with a police car that joined the force late in life.